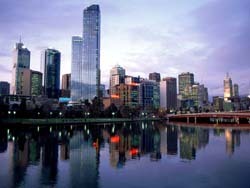 The presented room availability, rates and discounts are actual and final for all our 272 hotels in Melbourne. Tourists limited in time should give preference to the famous Melbourne tram as its route runs through the most scenic and remarkable areas of the city that turns a common tram trip into an exciting and engaging city sightseeing tour. Those having enough of time for Melbourne exploration should pay more emphasis to sights and landmarks of this tourist destination. The most famous cultural establishment of the city is considered to be The Victorian Art Centre being an established place for holding most various events. Opera concerts and dramatic performances, theatrical productions and ballet company performances are a few types of events one can find in the center’s poster advertisement. The city has preserved numerous historical buildings many of which survived in the long course of history unharmed and today appear in their initial look. Among inestimable landmarks of Victorian age the building of the General Post Office, the building of Parliament House, the Town Hall and the famous Princess Theater are best worth noticing and visiting. The last landmark of mentioned above will be of great interest not only for genuine connoisseurs of architectural art but for dramatic art fans as well. The same impressive, remarkable and symbolic landmark of the city of Melbourne is The Myer Music bowl.